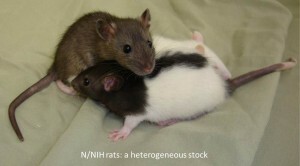 The N/NIH heterogeneous stock (HS) breeding core, under the direction of Dr. Leah Solberg Woods at the Medical College of Wisconsin (MCW), will provide HS rats to Research Project 1-3. HS animals are outbred from eight inbred rat strains and maintained in a manner that minimizes inbreeding, enabling the fine-mapping of quantitative trait loci (QTL). Dr. Solberg Woods’ laboratory has maintained the HS rat colony for the past seven years and hers is the only laboratory in the North America to house this unique resource. As part of the HS Breeding Core, the HS rat colony will become a national resource, with HS rats available to all investigators within the Center as well as to investigators outside of the Center on a cost-recovery basis. The two main goals of this core will be to 1) maintain the HS rat colony in a way that minimizes inbreeding and 2) ship a genetically diverse set of HS rats to Research Projects 1-3. To minimize inbreeding and control genetic drift, the HS rat colony will consist of 64 breeder pairs and will be maintained using a randomized breeding strategy, with each breeder pair contributing one male and one female to subsequent generations. The HS Breeding Core will ship HS rats (male and female) on a quarterly basis to Research Projects 1-3 over a four year period. By providing a genetically diverse set of HS rats to Research Projects 1-3, this Core will provide the back-bone for the studies proposed in this Center, namely the genetic fine-mapping and identification of genes involved in behaviors related to drug abuse. The HS rat colony was first established by the NIH in 1984 to serve as a source of genetically segregating animals for both experimental and selection studies (Hansen and Spuhler 1984, Fig. 1). The colony was originally derived from the following eight inbred progenitor (founder) strains: ACI/N, BN/SsN, BUF/N, F344/N, M520/N, MR/N, WKY/N and WN/N. Because most of these original founders are no longer available, recent phenotyping studies are conducted using similar founder sub-strains (see Preliminary Data, Research Projects 1-3 and (Solberg Woods et al. 2010; Solberg Woods et al. 2012; Richards et al. 2013)); Because a high degree of genetic diversity was one of the initial goals of creating this colony, founder strains were chosen to encompass as much genetic diversity as possible. At the time, full genome sequence, or even high density marker panels were not available. In the absence of this information, the investigators chose strains based on strain origin, choosing only three strains from the popular Wistar stock (MR/N, WN/N and WKY/N), with the other strains coming from varying origins (Hansen and Spuhler 1984). Since the time the colony was developed, it has been confirmed that these eight progenitors encompass a broad degree of genetic diversity (Saar et al. 2008). All original founders have recently been fully sequenced (Baud et al. 2013) and this sequence is publicly available on the Rat Genome Database (RGD). Comparison of F2 intercross strategy with HS strategy. 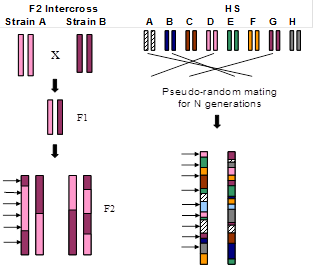 Different colored bars represent genetic background of the inbred strains. Arrows represent hypothetical genetic markers. The average distance between recombination in the F2 generations is approximately 30 centiMorgans (cM), whereas it is approx. 2 cM in the HS. The N/NIH heterogeneous stock (HS) breeding core, under the direction of Dr. Leah Solberg Woods at the Medical College of Wisconsin (MCW), will provide HS rats to Research Project 1-3. HS animals are outbred from eight inbred rat strains and maintained in a manner that minimizes inbreeding, enabling the fine-mapping of quantitative trait loci (QTL). Dr. Solberg Woods’ laboratory has maintained the HS rat colony for the past seven years and hers is the only laboratory in the North America to house this unique resource. As part of the HS Breeding Core, the HS rat colony will become a national resource, with HS rats available to all investigators within the P50 as well as to investigators outside of the P50 on a cost-recovery basis. To request HS rats, please contact Scientific Coordinator. You may also contact Dr. Palmer or Dr. Solberg Woods to discuss details of the project.